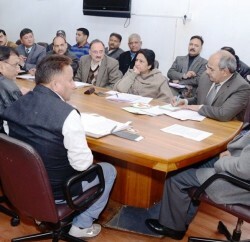 Fifth meeting of State Executive Committee of Himachal Pradesh State Disaster Management Authority was held under Chief Secretary S. Roy. The State Disaster Management preparedness was discussed in the meeting in which various suggestions were made by the members to be incorporated in the plan. 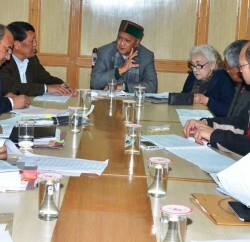 It was also emphasised that the District Disaster Management Plans should also be prepared at the earliest. It was informed in the meeting that most of the departments had appointed the nodal officers in their respective departments for disaster management but some were yet to appoint. The Chief Secretary desired that such departments be asked to do the needful at once. 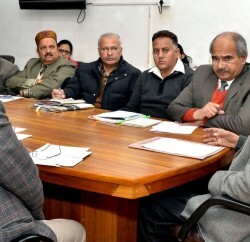 It was also informed in the meeting that 32 percent areas of the State were very highly vulnerable to disasters and 68 percent were highly vulnerable so it was essential that the disaster management preparedness was given priority so as to avoid any untoward incident during disasters. Deepak Sanan, Principal Secretary, Revenue, P.C. Dhiman, Principal Secretary, Home, Dr. D.S. Manhas, Director General of Police and other senior officers attended the meeting.